This is one of my husbands favorite meals, I hadn't even heard of it until we got married. This is our version. peel, and cut the potatoes into chunks for fast boiling, boil until they fall off your fork. Mash potatoes and mix in enough milk and butter to make creamy. Add your garlic salt to taste. Pour your gravy mix into the ground beef and add 3 TBLS water, mix well. 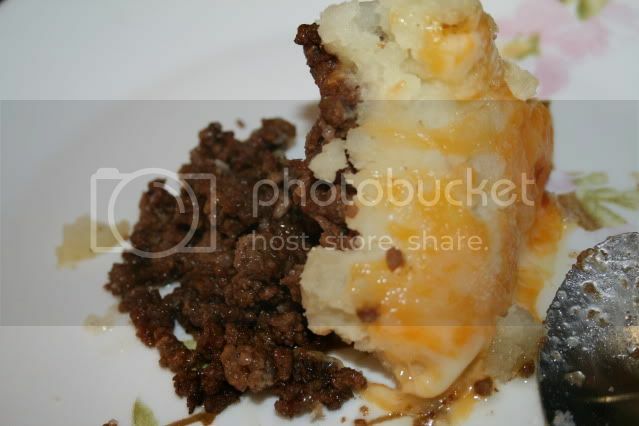 Put finished beef on the bottem of a caserole pan (no need for non-stick spray will be fine with the grease from the ground beef) Pour the drained can of corn on the top spread evenly, pour the finished mashed potatoes over the top and flatten. Add optional cheese, throw in the oven at 350 for 15-20min and your good to go! This sounds delicious. Thank you. I am going to try this one for sure.